Author: Derek Nurse. Series edited by: Hans-Jürgen Sasse †, Rainer Voßen. About AD 1600 two events took place which led to the linguistic phenomena described and analyzed in this book. In Eastern Kenya a small group of people speaking a Bantu language known as Daiso broke away from their parent group and migrated south along the coast into Tanzania to a new home, amidst new neighbors. Slightly further east, another migration, which had originally started in Ethiopia, finally halted along the Tana River. As a result, the Cushitic-speaking, cattle-herding, immigrant Oromo settled around the Ilwana, a long established, sedentary group speaking a second Bantu language. As languages, both Daiso and Ilwana changed dramatically during the ensuing centuries, to the point where the later communities would have had trouble communicating with their linguistic forebears. Chapter 2 describes contemporary Daiso and compares it with what it probably looked like in AD 1600. It outlines the most salient linguistic changes, and analyzes the extent to which they derived from contact with its new neighbors. Chapter 3 does the same for Ilwana. Over 50% of the vocabulary of both languages has been replaced, new sounds have been added, and considerable change has occurred in the structure of the nominal, but especially of the verbal system. Certainly by late in the nineteenth century, possibly earlier, the changes were complete and two new languages had emerged. The linguistic results and the very speed of the changes will be surprising to some and run counter to prevailing opinions. 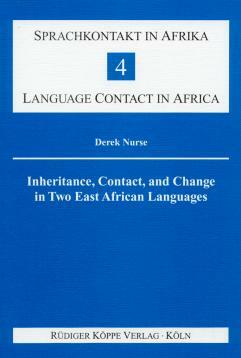 In a final chapter, therefore, the author examines other described cases of linguistic change in East Africa, and compares them to what happened to Daiso and Ilwana. The conclusion is that what occurred is not unusual and that changes of this nature and extent might happen to any language, given the appropriate circumstances. [...] the book is recommended as a worthy and thought-provoking contribution to both comparative Bantu studies and historical sociolinguistics. [...] the book is a step forward in the historiography of Bantu languages. The author is well aware of the methodological difficulties connected with the historical interpretation of his material. He does not try to conceal these difficulties, but discusses them thoroughly. He draws historical conclusions only when his data allow it. Those who are interested in working at the vast construction site of Bantu historiography – in collecting more linguistic and extralinguistic data, in experimenting with them, and in developing new tools for historical analysis – will welcome this book as a rich source of material, suggestions, and ideas.